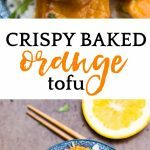 This Crispy Baked Orange Tofu is reminiscent of the popular Chinese dish. 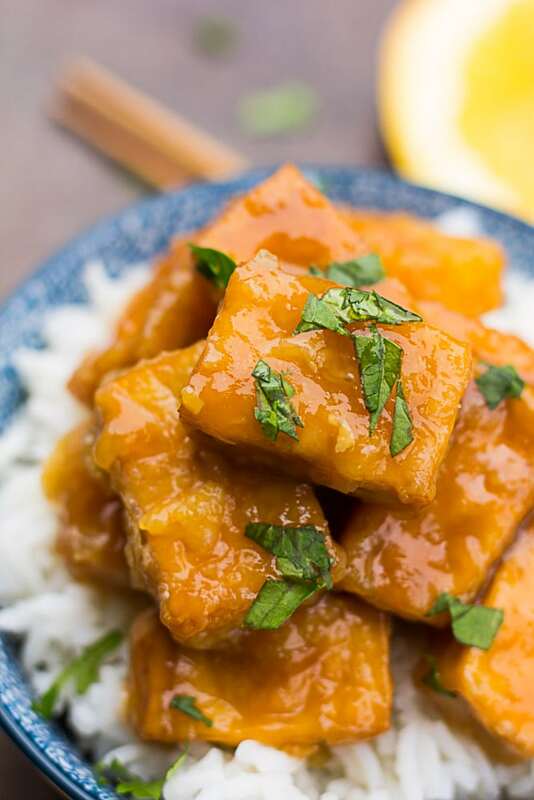 A sticky, sweet orange sauce is paired with the most amazing crispy BAKED tofu! 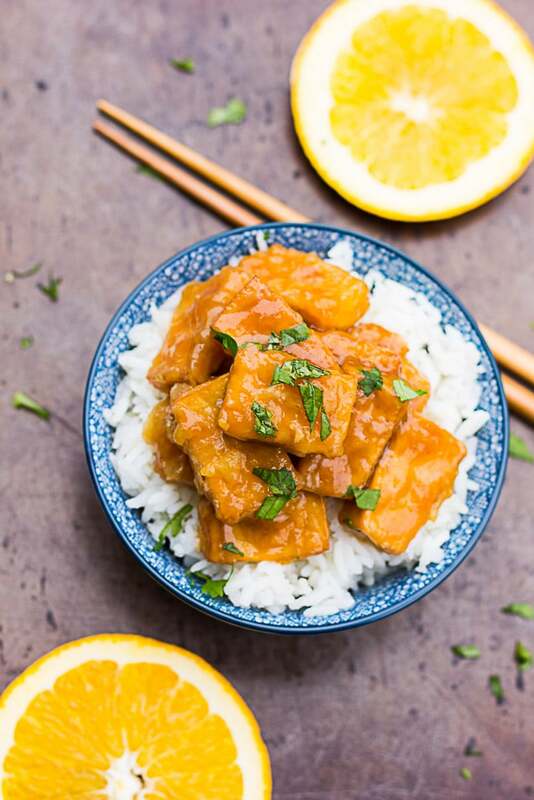 Serve this mouthwatering Orange Tofu over brown or white rice. Before going vegan some 8 years ago, I barely EVER cooked and we ate out a lot. I cringe when I think of the way I used to eat back then! It’s no wonder my stomach hurt so often after meals! I never could have imagined how much I would grow to love cooking once I cut animal products out of the picture. Yes, I still have a sensitive stomach, but I feel so much better than I did when I still ate animal products! Anyways, one of those meals I ate all the time was Panda Express Orange Chicken. Oh my gosh, I loved that. Mostly I loved the sauce, not so much the chicken. I have been wanting to create the perfect vegan version of that dish for a long time, and I’ve finally done it! Except this one is SO much better than the original. The sauce is super fresh. The tofu is perfectly crispy, but not greasy at all (since there’s no oil involved). This recipe makes enough for about 5 large servings, so if you don’t need that much food, feel free to halve the recipe. This does make some excellent leftovers though! Crispy tofu adapted from Cookie and Kate. 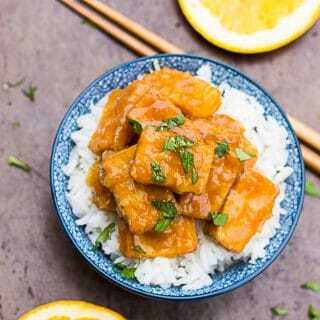 Reminiscent of the popular Chinese Orange Chicken, but a plant based version that tastes better than the original! This tofu gets perfectly crisp, without any oil, in the oven with a little cornstarch/soy sauce mix. Serve over rice and with a good serving of steamed broccoli. Press the tofu by wrapping in paper towels (or a clean dry tea towel). Place a plate or pan on top of the wrapped tofu, and put a couple of heavy books on top of that. Let the tofu press for at least 30 minutes if possible and up to an hour. Preheat the oven to 400 degrees F and line a large baking sheet (or 2 if necessary) with parchment paper or a silicone mat. Slice the tofu into 2 inch squares or rectangles and place in a large bowl. Drizzle on the tamari or soy sauce and toss gently to combine. Sprinkle on the cornstarch and toss to combine. You can also use your fingers to gently rub the cornstarch into the tofu, until almost no powdery spots remain. Arrange the tofu evenly on the prepared pan(s), and bake for 15 minutes. Flip and bake for 15 more minutes, until the tofu pieces are crispy and lightly golden brown. In a large pan (like a wok or stir fry pan), add all sauce ingredients except the cornstarch and water. Bring to a boil, and cook for a minute or two. Mix the cornstarch and water in a small bowl to combine, and then add to the pot. Whisk over medium-high heat constantly for a couple of minutes, until the sauce thickens. Now add the Crispy Baked Tofu to the saucepan and stir to coat the tofu in the sauce. Serve over brown or white rice. Sprinkle with cilantro, green onions and/or sesame seeds. Add a side of steamed broccoli if desired. To make this recipe Gluten Free, make sure to use tamari, not soy sauce. This recipe makes enough for 5 people. It does make great leftovers, but feel free to halve the recipe if desired. Also a great way to get the tofu crispy, awesome! Thanks for the great recipe, I will definetly make it again, hopefully with improved colour! Thanks Anna! I’m glad you enjoyed the recipe! I used a light sodium soy sauce from Trader Joe’s, I suppose it would vary quite a bit depending on the brand you use. Crispy tofu is the way to go! 🙂 Try a different brand of soy sauce and hopefully you will get a prettier color next time around! Made this a couple of nights ago for myself and my omnivore teenage son. I tossed some steamed broccoli into the sauce with the tofu and we served over brown rice. I’ve only been vegetarian since last June and trying to eat more WFPB for a few weeks, so I don’t have a lot of experience working with tofu. This was the first time I’ve tried to make it “crispy” and we both enjoyed it very much! I only had 1 16-oz block of tofu but made the full recipe for the sauce and that worked out very well for us. The tofu was crispy and had a great texture–not chewy at all. Definitely the best tofu I’ve cooked in my limited experience. There were a few pieces left over, which I had the following day for lunch and whilst the texture was much more in line with other tofu I’ve had, the flavour was delicious and the extra sauce soaked into the leftover rice and the tofu very nicely. We will absolutely make this again as written and I think we will also use the sauce over veggies or with meat when my kids are home. Thank you for sharing your recipe. I’m glad you had a good experience with tofu! I know, some people don’t like it, but usually it’s because they haven’t prepared it correctly, I know that was me in the beginning. It takes some time to get to know tofu! I’m glad you enjoyed the recipe, thanks so much for sharing! Beautiful looking recipe, do you think this would work with cauliflower? We aren’t fans of tofu but this sounds delicious ? Really good! Reminds me of Panda’s orange chicken. This was awesome! I roasted a bunch of veggies in some asian type spices right alongside the tofu in the oven and threw them in with the tofu and rice and it was delicious! Great idea Chelsea! So glad you enjoyed it. I’m dipping my toe in the water again with tofu as previous experiences weren’t great, and this recipe sounds very tasty. Just wondering, if there are leftovers, how the best way to reheat it is please. Oh good! I hope this goes well for you! My whole family can’t ever get enough of this orange tofu! With leftovers, I just reheat in the microwave until warm, works just fine. You could also warm on the stovetop if you don’t use a microwave. This is so delicious! I have never cooked with tofu before and I don’t think I squished it enough even though I squished it for an hour. It was still a little spongey but it still tasted so good!! I didn’t want to waste a drop of the delicious sauce so i added some steamed broccoli right before serving. I’m going to order a tofu press since I will want to make this often! Thank you so much for posting the recipe!! I’m so glad you enjoyed the orange tofu! That sauce is delicious, right? You are so welcome!! So good. So good, so good!